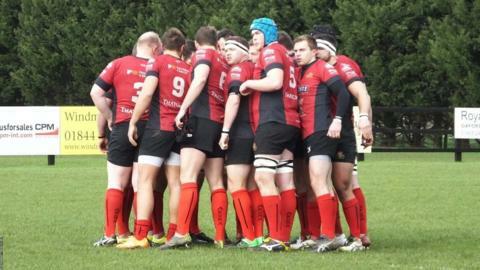 Redruth boss Steve Larkins says the confidence of his younger players is helping his more experienced players. The Reds have already beaten last season's league points total as they prepare to face Canterbury. Their record has been helped by six away wins, two more than in their last two seasons in National Two South. "These young players have come in with no pre-conceptions about going on the road and winning away from home," Larkins told BBC Radio Cornwall. The Reds, who have had their last two games postponed, are on course to match or better the seven away wins they got in the 2012-13 season, when they finished fourth. "All their rugby careers have been travelling away already, even at 19 or 20, so they've got no fear about going away and putting in good performances," added Larkins of his youngsters. "That sometimes helps the older players as well, to put pressure on them, but it's always good to have that core of players who've got 100 or 200 games under their belt at National League level. "It's an interesting mix we've got at the moment of the old and the young, but it's a very good balance and it's proving successful at the moment."